The Redemption of Sean Spicer? Choke on it. So, we could see this coming when he appeared at the Tony’s. Sean Spicer wants us to be redeemed. He regrets embarrassing his friends, families, supporters, and the nation. He made some mistakes. Oopsies. We see in his comments on MSNBC earlier this week, though, that he doesn’t really get it. He doesn’t regret taking the job because it was the “opportunity of a lifetime.” So, in other words, it was great for him (even though it was also hard), with no consideration of what his lies and his normalization of lies and his gaslighting did to the nation. You’ve heard me complain before about entitled white men who cavalierly inflict pain on others because it looks good on their resume. I’ll spare you a repeat of the argument. In other news, my littlest received a beautifully illustrated Aesop’s Fables for Christmas, and we have been reading it almost daily. A favorite right now is “The Wolf and the Crane.” In the story, the wolf has gobbled his food too fast and gotten a bone stuck in his throat. He can’t dislodge it–which means he can’t eat, and “naturally that was an awful state of affairs for a greedy Wolf,” the story tells us. 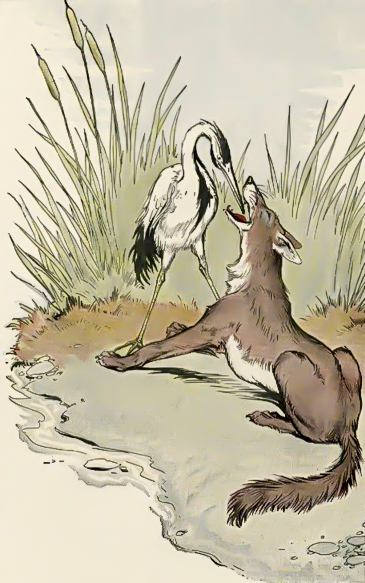 Above, the Crane plucks a bone stuck in the Wolf’s throat in this illustration from Aesop’s Fables. So he asks the Crane, with his long beak, for help. She’s a little nervous about the prospect, but as “she was grasping in nature,” she sticks her head in his mouth and picks out the bone. The Wolf immediately begins to walk away, and the Crane boldly demands her reward. He reminds her that surviving having her head in the mouth of a wolf is reward enough. The moral: Expect no reward for serving the wicked. In other words, Sean Spicer is lucky to have gotten out in one piece. He doesn’t deserve anything more. Next Next post: Does Jesus want me to love Chuck C. Johnson?